Who have YOU hugged today? 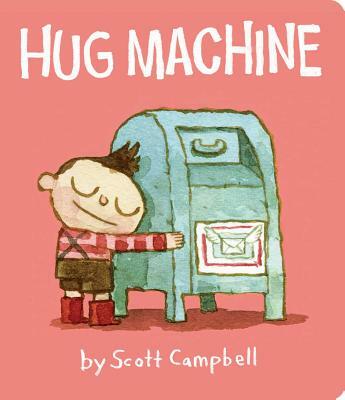 Open your arms to this delightfully tender, goofy, and sweet board book from Scott Campbell. Watch out world, here he comes! The Hug Machine! Whether you are big, or small, or square, or long, or spikey, or soft, no one can resist his unbelievable hugs! HUG ACCOMPLISHED! Now available as a board book, this endearing story encourages a warm, caring, and buoyantly affectionate approach to life. Everyone deserves a hug—and this book! Scott Campbell’s paintings have appeared in numerous shows and publications around the world. He has created award-winning comics, such as “Igloo Head and Tree Head,” which appeared in the Flight anthology, and is the illustrator of Zombie in Love and Zombie in Love 2 + 1 by Kelly DiPucchio; East Dragon, West Dragon by Robyn Eversole; and If Dogs Run Free by Bob Dylan. He is the author and illustrator of Hug Machine. Scott lives in New York City. Visit him at PyramidCar.com.